Look for a * by the colors which show off text the very best. We've noted the SIZES available below the picture and color name of each band. 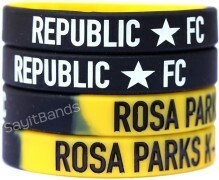 We also offer free custom color combinations on orders of 250 or more bands. Email us at email@sayitbands.com for more info. These are currently stocked in ADULT size. On orders of 200 or more bands we can make CHILD size and we can color match for free too! Email us at email@sayitbands.com for more info.